This page created 1st September 2012. The Scania version of the Wright Pathfinder low-floor bus was ordered by London Buses and delivered to two of its subsidiaries in 1994, before the privatisation started later in the year. Leaside Buses had the first fourteen for route 144. SLW1-14 were based on the Scania N113 chassis, re-engineered as a low-floor version. Wright Pathfinder bodywork was added, in a two doorway mode. The front doorway had a large single door, the central exit a pair of doors. Internally there was a considerable step up behind the central doorway, the last six rows of seats being considerably higher over the engine compartment. With the wheelchair space, and luggage bins over the front wheelarches, this did not leave very many seats in the low-floor area, a problem that was to bedevil all low-floor designs in practice. London Buses gave them all-red livery with prominent low-floor bus logos with down-arrows. Leaside Buses added a yellow window-sill below the front windows. Route 144 (Edmonton Green - Wood Green - Hornsey - Muswell Hill Broadway)was a replacement for the 144A. SLW1-14 started the new route in September 1994, and were privatised as part of Cowie Leaside in September. 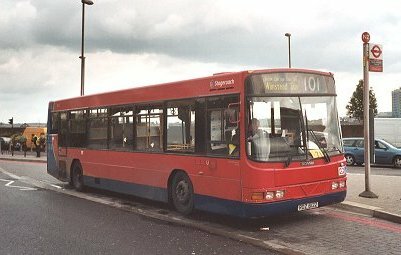 The low-floor single-deckers stayed on the 144 until March 1999, just into the Arriva era. Then the 144 was double-decked with low-floor DLAs, and the still-young SLWs were redundant. Arriva moved them north to Arriva North-West in Liverpool, where they became 1071-1084. Roadrunner of Harlow bought SLW8-12 and 14 from Stafford Bus Centre after Arriva had finished with them, in June/July 2010. Another, SLW7 was bought through e-Bay from Aintree Coachlines in September. They were bought for Roadrunner's route R3 (Harlow - Waltham Cross), as part of the intense Harlow competition. They were repainted white with blue skirts and Roadrunner fleetnames and logos, with route branding on the cant-rail. Roadrunner operated them for a year, until July 2011, when they were replaced by Dart SLFs. 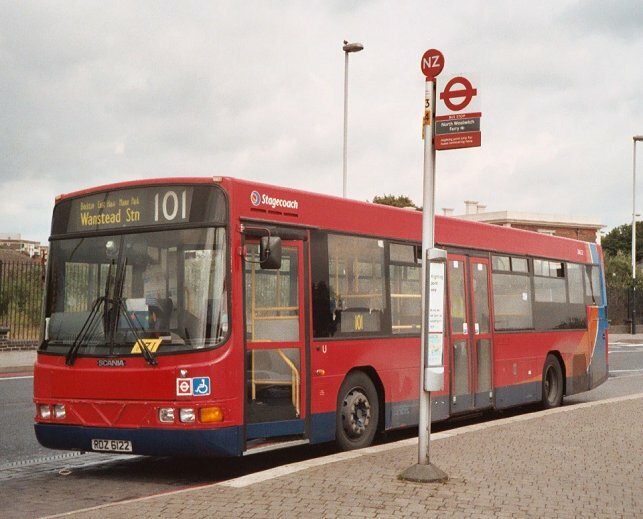 The other sixteen were delivered to Stagecoach East London, to Upton Park for use on the 101 (North Woolwich Free Ferry - Manor House). Their livery was much the same as those for Leaside, except that the front dash panel was black rather than yellow, and they had Stagecoach East London logos. The low floor arrows and descriptors were the same. They stayed put on the 101. They received repaints into Stagecoach's swirl livery with navy skirt, minus the low-floor arrows and descriptors as low-floor became the norm. Stagecoach national numbers eventually caught up with them, and they became 28615-28630. 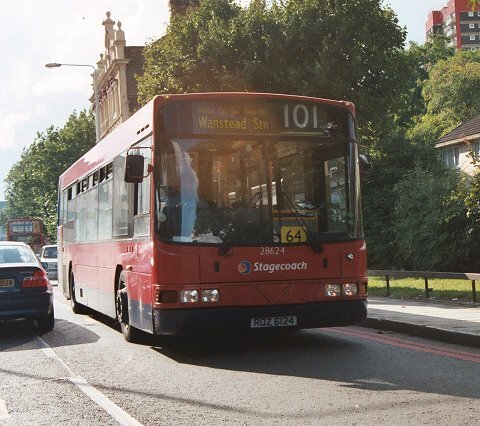 Some became trainers in the autumn of 2004, when more double-deckers arrived at Upton Park for the 101. 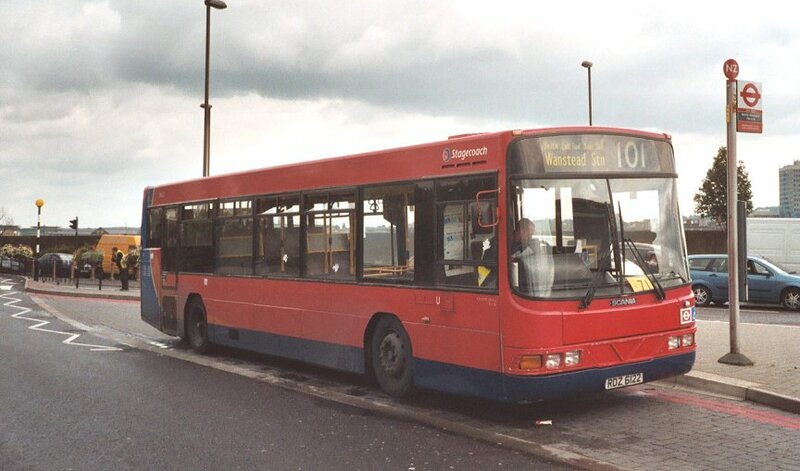 Some were repainted in lime green or purple training livery, replacing Optare Deltas from the training fleet. This also took some of the Scanias away from Upton Park for the first time, as trainers went to Waterden Road. 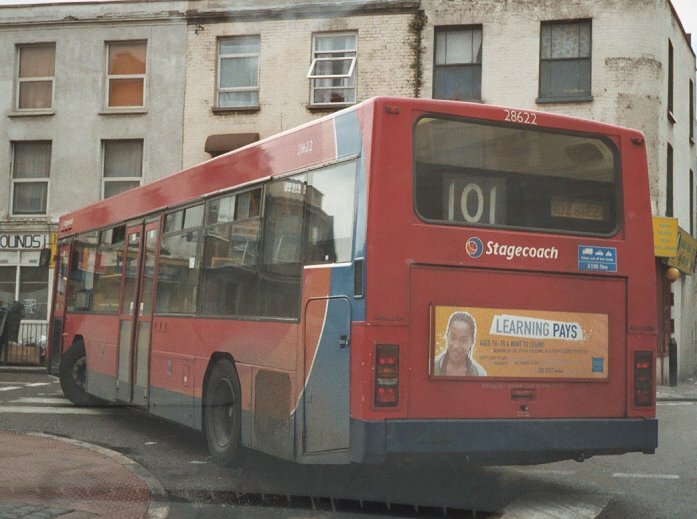 The end on the 101 came in March 2006, when they were gradually displaced by Tridents and withdrawn to store at Waterden Road. Some remained in use as trainers at Upton Park and Waterden Road, some in red, others in green and purple. 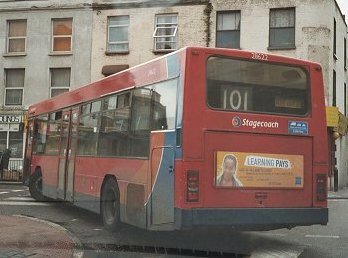 The withdrawn buses were promptly officially reinstated as trainers, initially at Upton Park, but then spread around the Stagecoach garages to Barking, North Street, Upton Park and Waterden Road, as well as south of the river to Plumstead, Catford and Bromley. 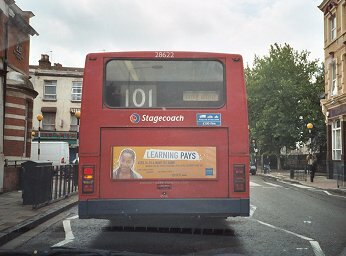 Stagecoach's London operations were taken over by Macquarie Bank at the end of August 2006, becoming the East London Buses group. This included all the Scania trainers. 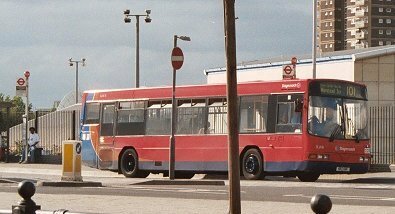 The Upton Park and Barking trainer allocations soon moved to Waterden Road, but that garage had to close to make way for the O*****c Park at the end of 2007, its buses, including its Scania trainers moving to a new site at Rainham. Their training role came to an end in the late summer of 2011, when they were sold off the Ensign Bus of Purfleet, who sent them off to the Yorkshire scrapyards. North Woolwich (Free Ferry), terminus of the 101. SLW16 and SLW24 on 1st September 2004, wearing swirls and their old numbers, despite official renumbering nineteen months earlier. 14th July 2005: there was a long queue for the Free Ferry. I followed 28622 as we slowly inched round the corner towards the ferry and bus terminus. Once I was stopped in the Ferry queue I had an excellent opportunity to see the other sides of 28622 at the terminal stop.. These first low-floor versions of the Scania N113 were followed by the Scania L113 and later the L94UB, where the early bugs that had bedevilled these first low-floor buses were ironed out. 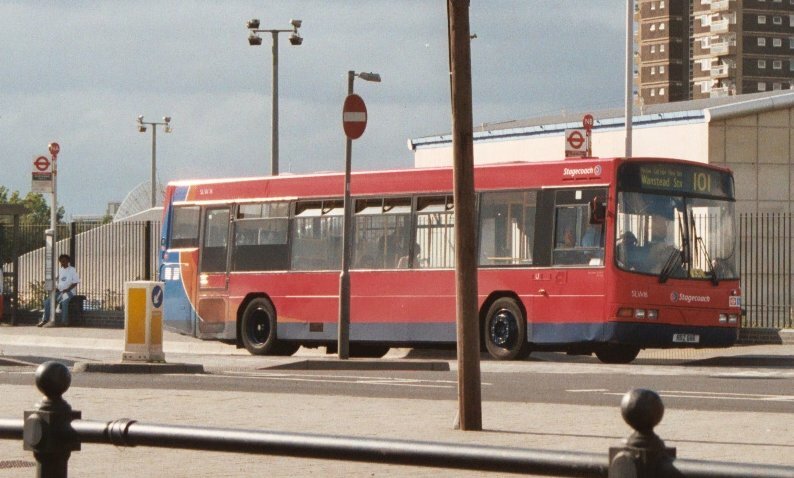 The Wright Pathfinder was followed by the Axcess Ultralow, and in 1995 these appeared with Arriva Kent Thameside... Luton & District opted for East Lancs European bodywork on the Scania L113, these passing on the Arriva the Shires, who themselves had some L113s bodied with Northern Counties Paladins. SLW. Kentish Bus L113. LDT L113. Ian's Bus Stop SLW text. SLW bus histories. SLW photo refs.